This entry was posted on August 14, 2017 by Team Baader Planetarium. Last modified on August 18, 2017. Don't miss out to read customers comments and our detailed replies below. Amazon screwed up. I've been telling them that for weeks and as the problem gets worse, the person there stopped responding to me. I think they're overwhelmed. They know they screwed up. They're trying to do the best they can. They don't know what they're doing. On Sat, Aug 12, Amazon sent an email to all customers who had purchased a wide variety of solar products (glasses or viewing cards) from several of our US-dealers that the product they received may not be safe of certified, and they recommend that customers not use these items. The email states that "Amazon has not received confirmation from the supplier of your order that they sourced the item from a recommended manufacturer." This is completely untrue and incorrect. 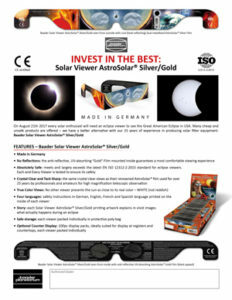 Please note also the PDF "Invest in the best" (above) with the Specs of our Solar Viewer. 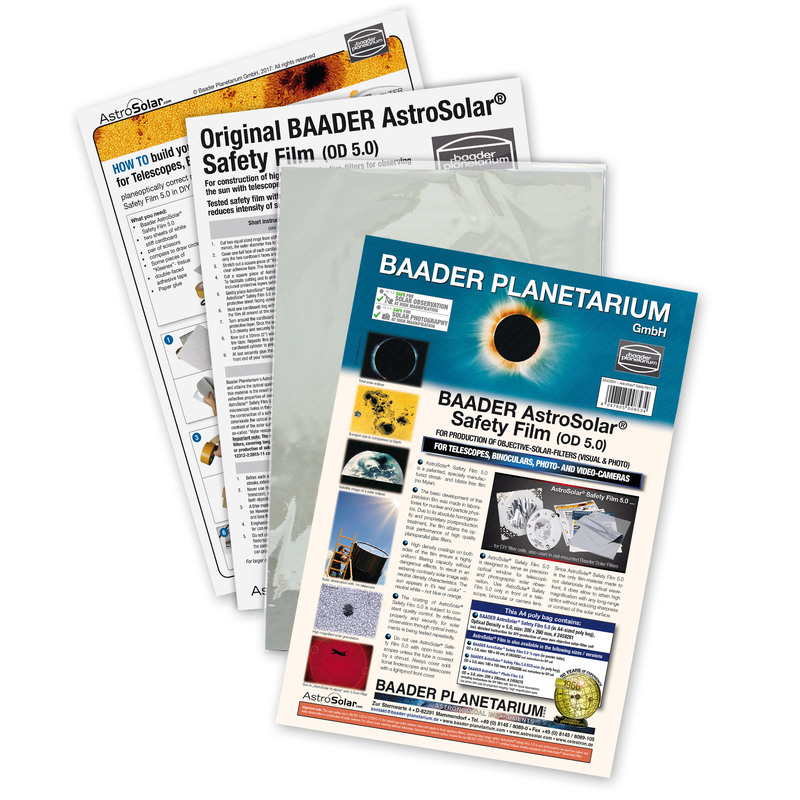 If the Solar Viewer you purchased looks as in the pictures (same printing, inside black film, outside silver film) than you can be sure that you purchased a genuine Baader Planetarium product, 100% Made in Germany with 100% Quality control of each viewer. Neither the film nor the mounting or printing is made in China. Regarding AgenaAstro: We also hereby confirm, that our distributer Alpine Astronomical has supplied our Solar Viewers to Agena Astro Products. They listed the viewers in Amazon and also supplied Amazon with the required ISO-documentation more than two weeks ago. Amazon however neglected this and now AgenaAsto is held responsible for this "overprotective action". Please rest assured that Solar Viewer AstroSolar® Silver/Gold that where purchased on Amazon by the seller agenaastro are legitimate Baader Products and safe to use! In case you can't get your hands on viewers or film anymore to observe the solar eclipse (e.g. with your school class / children) there is an alternative to Solar Viewers and Film that can be done with household items only. You can build your own "Camera Obscura" to observe the eclipse phases without looking directly into the sun. Please check out the following PDF: How can i observe the eclipse in full safety without buying any commercial product? Let us officially state that Baader Planetarium AstroSolar® Safety Film 5.0 is in production for more than 25 years and not one single person in all this time has been injured or had suffered eye problems during - or long after - using AstroSolar® Film for observing the sun with the naked eyes or through any kind of optics up to one meter in clear aperture. Since a new ISO-norm 12312-2:2015 for eye safety came into being, we have no rights to declare the old DIN-norm EN 1836 safe for direct "eyes-only" solar viewing, e.g. with eclipse viewers. However - as long as that old norm was in place, we had collected 25 years of experience though. In all this time we did not receive information about any single case of eye irritation or eye damage while approx 20 Million people each used one Baader solar eclipse viewer equipped with a single layer of AstroSolar Silver film to directly observe the sun. We do supply AstroSolar® to two sources in the U.S. and from there AstroSolar® is being offered at Amazon and multiple dealers. As long as you purchase the original size of Baader ECO-Film (EAN# 2459286) or Baader A4 Film (EAN#2459278 ) or Baader 100x50 cm film (EAN#2459282 ) you are sure to receive a genuine Baader product. 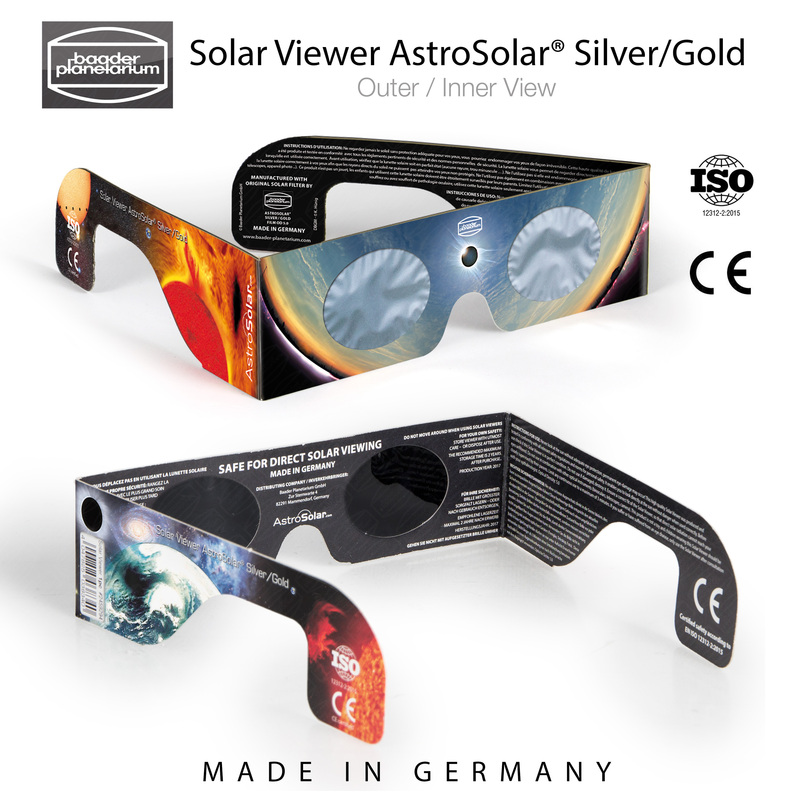 And we wholeheartedly recommend all makes of readymade solar filters in cell mounts for most telescope sizes - as long as they are being produced in Germany or inside the USA (such as Kendrick or our Baader cell mounted filters ASTF/ASSF/ASBF). In 2015 the new ISO-norm 12312-2:2015 had been installed for eclipse viewers only, which requires a tiny fraction of higher optical density in the UV as added safety measure for meeting possible law problems in the U.S. For this reason AstroSolar® Film would still remain the only diffraction limited film for using in front of any optical device but must not be recommended anymore for producing eclipse viewers without adding reduction of UV-transmission. At this point, please let us state that there IS NO STANDARD for for any type of solar filter except eclipse glasses and other solar viewers meant to be used for eyes-only direct observation of the Sun. That’s what the ISO 12312-2:2015 standard applies to — nothing else. How do we know that certain aperture solar filters are safe for use with telescopes, binoculars, and camera lenses? Because they come from reputable manufacturers whose products have been tested by people with access to the appropriate equipment — such as optometrist and eclipse chaser Ralph Chou of the University of Waterloo — and found to be safe, and because they have been used in the field by thousands of astronomers without any problems for years. AstroSolar® is the single highest-quality material in the world for producing front objective filters for Telescopes, SpottingScopes, Binoculars and Cameras - but the film alone must not be advertized anymore for production of eclipse viewers - unless you would combine it with an added layer of dark film - or use it together with dark sunglasses which are blocking the UV anyhow. But even in this case you would not create a product that is ISO-compatible because this very product of yours might be perfectly safe - but it had not been officially certified to be so. Talking straight - your homemade eclipse viewers would not become ISO-compliant anyway, because it is not enough to just use ISO-certified film - the finished viewer would need to be ISO-certified as a whole, in order to be completely lawful and to not present any risk - to the seller. Any selfmade paper-film-holder that might be blown away or that might not cover the face well enough would become "risky business" - with hysteria about solar eclipse eye safety running to a peak within these very days. But if you are not selling your DIY-product but are proudly using it for yourself and with your family - were is the judge that will ask about the certification of your private DIY-activity? For our own new and ISO-compliant solar eclipse viewers we had combined AstroSolar® Silver film with a special made dark film that has the same properties as a very dark pair of sunglasses - completely blocking the part of the spectrum below 400 nm. And this combination has been ISO-certified - which is very expensive and time consuming. The results of this certification process is registered at the AAS as stated above. 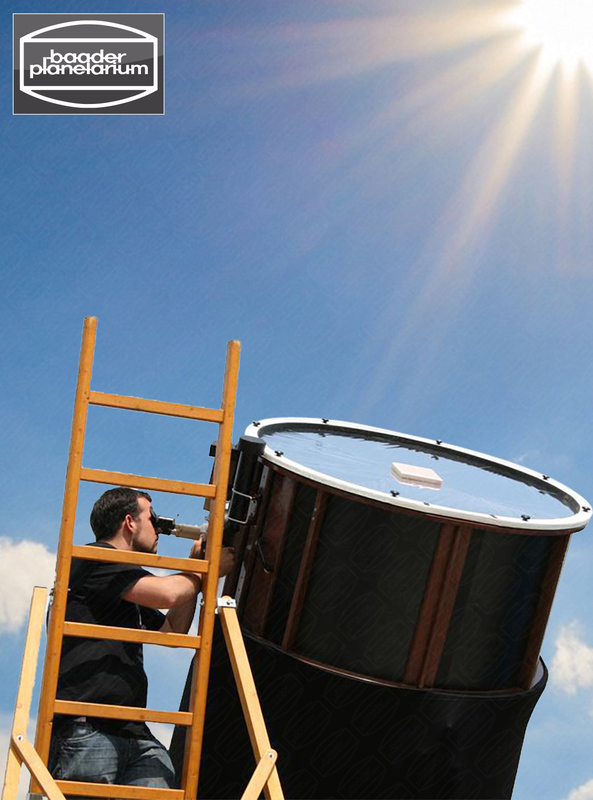 We do recommend AstroSolar® Safety Film as single sheet without any extra layers for making solar objective filters for astronomical/terrestrial optics with all care taken. This is lawful and does retain the value of the film. If used for eclipse viewers the true optical quality grade of AstroSolar® would be wasted somehow. AstroSolar® film has the same properties as a precision polished planeparallel piece of optical glass and hence is good for 250x magnification and more, which is much better than any other solar film or "economy-priced" glass filter on the planet. The Baader-Planetarium AstroSolar Silver/Gold glasses I purchased through Amazon have the number #2459294 in the corner. Are these authentic and are they safe for viewing the ecliple? Yes, this is our item number and they are safe to use. Enjoy the eclipse! is this safe to use on my camera lens? Is my Baader AstroSolar Viewer safe even if it would have wrinkles, folds or creases? Your AstroSolar Viewer is perfectly safe. Each single viewer has been safety-tested and is tucked into it's own protective poly-bag. After each time you used it put it back into it's poly bag and it will serve you for years to come (the next total eclipse in the US will commence on April 8th 2024). Like published many times for AstroSolar Film, the film is mounted loosely in it's paper frame to retain the ultra high quality which AstroSolar is known for. When looking at the film you might have the impression it would show wrinkles - and this is perfectly normal and that's how it ought to be. All our product images do show how this will look like. Wrinkles in this case are a sign that the film is mounted correctly. What we do not let pass though are real folds and creases in the metal film. Even these will not be dangerous in the least - but they could impair the high optical quality of the solar image. Do not let the viewer fall into dirt, do not let it collect dust over some weeks, do not put it flat on a table while rubbing it back and forth - that is - do not violently scratch off the metal coating visible at the front side. AstroSolar film is metallized on both sides. Even some scratches on the front side will not be dangerous for your eyes! This material has a 25 years history and we stand behind it. In addition, the special (non-soot) black film that complements the metal film will work as an added safety layer and definitely the combination of materials will keep your eyes out of harm. Even so we do insist that each viewer must be tested by you as well before each use, to check if any changes have appeared over time due to wrong handling or improper storage. If your viewer is torn from age or use, if it shows bright pinpoints during a short glimpse towards the sun, then discharge it and get a new one. Thanks for this clarification...much appreciated! however I purchased the "Deluxe Solar Filter 80mm Adjustable Cap Metal"
from Astromania via Amazon because they claimed they used your your AstroSolar Safety film. Can you verify this? I plan on using it over the objective lens of my DSLR, which I understand is perfectly acceptable. We ourselves only supply to two distributors in the USA: Astro Physics in Illinois and AlpineAstro in Colorado. However - we know that both importers do supply to a big number of filter cell makers in the USA and we do not doubt that all of them are very aware of the danger coming along with solar observation - and that all of them do their very best to protect their customers. If you receive a cell mounted filter which has a metalized surface on both sides (not one side metal and one side black) then it is most likely genuine AstroSolar material built into that cell. To our knowledge no one has successfully copied AstroSolar until now. Most competitors try to get away with much simpler soot-filled PET-film (which does not have real optical properties) and some even go as far as to metalize that dark PET-film on one side, in order to exclude a vast amount of IR (=heat) that the dark film alone would let enter into your camera. However - in order to stand the metalization process - that dark PET-film must be thicker even than the non-metalized variant - so the outcome in terms of optical quality is even less. AstroSolar btw is the only material that would render the sun in its true color: white. So that you have a choice across the full visual spectrum and eventually choose added color filters in case you would want to focus your attention onto the green part or blue or red part of the energy emitted by the sun. All other objective filters offered do show the sun in a predominantly reddish glow - excluding most of the spectral information available. 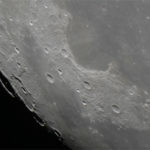 Using Astrosolar will keep all your options open for a great eclipse experience - with natural looking pictures. Good Morning America said to test all eclipse viewers, one should look at an older lightbulb lit, and only see the filament inside. We purchased your glasses in Amazon and after looking at the lightbulb we see nothing at all. Is this a true test? Short answer: actually this proves that our Solar Viewers are as good as we state – and exceed the requirements of the current DIN norm ISO 12312-2:2015. Long answer: This “old bulb advice” is very irritating. There is a steep difference wether you inspect an old 15 Watt bulb or an old 150 Watt bulb / wether the bulb has a frosted or a clear glass shell. Another story are LED lights (e.g. from a flashlight) – you will always be able to see these comfortably with our viewers. It will also make a difference wether you wear your solar glasses tightly pressed against your face or if you let light from behind hinder your pupils to open fully. For instance: the amount of light-energy that enters the eye will increase ten fold when comparing a 2mm daylight pupil opening against a night adopted pupil with 6 or 7 mm aperture. AstroSolar eclipse viewers reduce the light intensity by a factor of 100 000. If you take AstroSolar-glasses tight onto your face – so that no side-light can hinder your pupils from opening up fully – and if you give your eyes a minute to accommodate for the darkness – then look straight into your LED-flashlight while it is placed about one meter away, then you will see the LED-emitted light brighter than before – but still not uncomfortably bright. If you were to repeat this procedure with a counterfeit eclipse viewer that transmits too much light, be sure you could not stand the amount of brightness with your pupils wide up due to the previous 1 minute dark accommodation period. The desire to move your eyes away from that “binding brightness” will be overwhelming. Fortunately all creatures have such a protective mechanism, they will look aside whenever direct solar energy falls onto the retina of the eye. And certainly you will NOT press your solar viewer against your face when observing the partly eclipsed sun – but let it rest on your nose comfortably and let your pupils stay in their regular day-lit aperture of ~ 2mm. Then the amount of energy entering the eye will just fit nicely to match the designed light transmission of the eclipse viewer and create a very pleasant view of a natural white sun. Real danger only exists with counterfeit glasses that are too bright or with viewing the sun through normal sunglasses or straight even w. naked eyes! If then someone would deliberately try to "stand the pain" and refuse to listen to its own protective reflexes but force himself to continuously stare straight into the sun - even if it would hurt - exactly this is the way to severe eye damage. Young boys and young men are reported aways again after almost each eclipse to be doing this ("who can stand the pain the longest"). The insidious effect then is that - after a short while - the pain starts to go away and the "reopsin" substance that translates light into electric signals is getting used up fast inside each cell of the retina within the region of the retina that is our center of vision. All of a sudden it is no problem anymore to continue to stare straight into the "blinding light". And indeed - it this "self-test" lasts all too long, then the retina cells will die soon after from the severe burn they had suffered. So this will cause a blurry dark spot to be dancing around in the middle of your vision - it is a VERY irritating condition - to NOT be fully blind - but to move a dark spot into sight whenever you want to focus anything. But NASA says that there are only 4 suppliers that are safe and you're not one of them! I've read on Forbes, this is very dangerous. Amazon says I should not use your solar filter. They state (quote): "Refer to the American Astronomical Society (AAS) Reputable Vendors of Solar Filters & Viewers page for a list of manufacturers and authorized dealers of eclipse glasses and handheld solar viewers verified to be compliant with the ISO 12312-2 international safety standard for such products. You will read the weirdest things in the next days - people are treated like cattle in these "modern times". 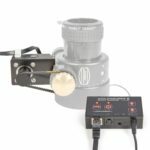 We are producing these products for solar observation for more than 25 years, our company is producing astronomical instruments since over 50 years. If we were doing it wrong - we were gone since long. There are many viewers available still - only the suppliers are asking outrageous prices for them. 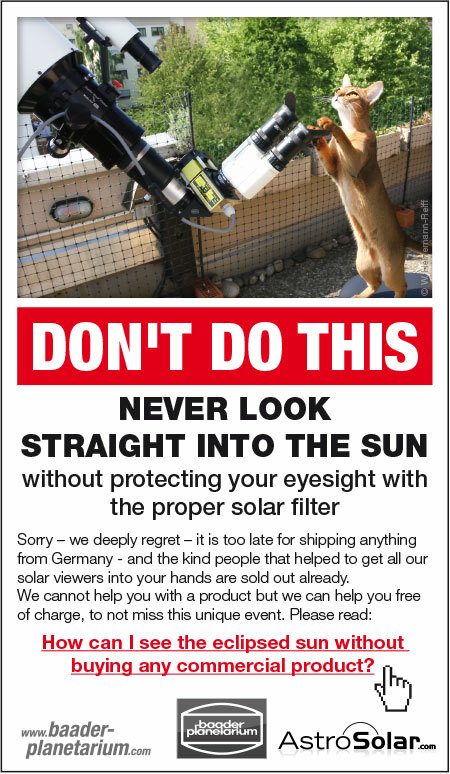 We do not participate in this rip off - on our site we are the only commercial company that advise you how to see the eclipse without buying anything as a last minute solution - who else would do that as a company. Well this should be good news. If still in doubt, just look at the item you received and compare with the images on our website. If it looks like our glasses (same printing, outside silver film, inside black film) you can be sure that you purchased a legitimate Baader Solar Viewer and you can enjoy the eclipse in safety. I purchased a solar filter for my telescope several months ago, and now Amazon is telling me it is not safe. 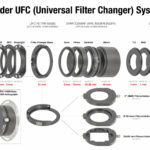 The filter is from Gosky and states that it uses Baader Safety Film with an optical density of 5.0. I already used it once before the Amazon notice and saw a white sun. Is there any way to know if this is actually Baader film and is safe? We only supply to two appointed distributors in China. However - we know that both importers do supply to a number of filter cell makers in China (amongst other Gosky and Solomax) and we do not doubt that all of them are aware of the danger coming along with solar observation - and that all of them do their very best to protect their customers. If you receive a cell mounted filter which has a metalized surface on both sides (not one side metal and one side black) then it is most likely genuine AstroSolar material built into that cell. 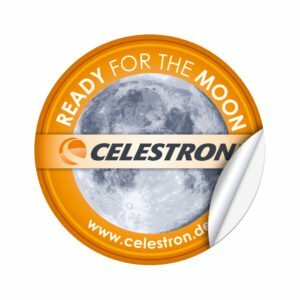 To our knowledge no one has successfully copied AstroSolar until now. Most competitors try to get away with much simpler soot-filled PET-film (which does not have real optical properties and which appears black on both sides) and some even go as far as to metalize that dark PET-film on one side, in order to exclude a vast amount of IR (=heat) that the dark film alone would let enter into your camera- or telescope-lens. However - in order to stand the metalization process - that dark PET-film must be thicker even than the non-metalized variant - so the outcome in terms of optical quality is even less. Double side metallized AstroSolar is the only material that would render the sun in it´s true color: white. So that you have a choice across the full visual spectrum and eventually choose added color filters in case you would want to focus your attention onto the green part or blue or red part of the energy emitted by the sun. All other objective filters offered do show the sun in a predominantly reddish glow - excluding most of the spectral information available. 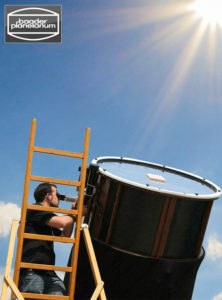 So in case the sun seen though your filter would not appear white - it most likely would be some other product. But as you already write: for you this this doesn't seem to be the case. Also please read the statements above that there is no DIN norm for front aperture filters. Amazon completely messed up here by writing this to everyone. The viewers I received from Amazon had a paper with the viewers that provided the following info: Agena AstroProducts, www.AgenaAstro.com. The # on viewer is 2459294 & it looks as you described in poly bag. My wife & son say they won't use them because of fear of counterfiting. You say? Please don't let Amazon's stupidity ruin this once-in-a-lifetime event for your wife and son! Please read our post again carefully, we've already written on the top of this page at the paragraph "Regarding AgenaAstro" that we confirm that those are definitely our products and our item number and safe to use. Noone has copied our viewers. AgenaAstro did purchase those viewers from our distributor and put them on Amazon. Also please read this interview with AAS official representative Rick Fienberg where he also clearly states that Amazon messed up by sending this message to EVERYONE even though many (if not most) of them indeed have legitimate viewers. I placed an order on Amazon for your glasses. The product page had an image showing of the glasses that is not the same as what I received. I also received an email from Amazon stating that mine are not good. Mine have a design on the front that is the night sky (purple) with the sun on one arm and the date August 21, 2017 and the moon and earth on the other arm. Both arms have the American flag on them. On the front is the words Solar Eclipse with a solar eclipse in the middle of the words. The back side says ISO with a notice that it conforms to the requirements... on one arm and the CE logo and directions on the other arm. Both the front and rear look black, the front does not look silver or gold. Are these your glasses? It does say Mfg by American Paper on them. I am very confused. In this case we confirm that Amazon did a mistake and sent you the wrong item. This product is definitely not from us. However it does sound like a legitimate product of the company "American Paper Optics". We know that they produced such products. And they are listed at the AAS website. However we can't guarantee you that those are legitimate products. You'd have to ask the company American Paper Optics. I have purchased your glasses #2459294, and when testing them I noticed the sun looks white with a halo eff ct. Is this how it is supposed to look? I have another brand through which the sun looks orange? What gives? Thanks for this site. I bought your glasses from Agena Astro, through Amazon. When I read about their warning, I did the research and I'm quite confident that they are genuine (they match your pictures exactly). My only concern is that I can see light bulbs while wearing them (incandescent, halogen, and CFL). Is that OK? This is not a concern, our viewers are tested and certified for safe solar observation. Please read our other comment regarding light bulbs and safety. It seems to me that you may have the makings of a nasty defamation suit against Amazon here, given the appearance of an egregious due-diligence lapse on their part and consequent publication of misinformation to the detriment of your business and its reputation, to wit an assertion that your product was not merchantable (as the Uniform Commercial Code defines this term) when it actually met that standard. Under such circumstances (defaming people in respect of their businesses) it may not be necessary to prove actual monetary harm in order for damages to be awarded by the court At the very least, the appearance of a reckless disregard of the truth by the accused should give you standing sufficient to have the case heard, and you may be able to get a generous settlement from the offenders if their attorneys advise them that this is the least of the possible evils. Certainly worth pursuing, I'd think. Good luck!